Last weekend I decided to pop into town to go beauty shopping! This is something I haven't done in years... I'm actually thinking it was maybe 6 or 7 years ago that I did this. I had no errands to run and I didn't have anything particular I wanted in mind, I just went to browse and shop. I surprisingly didn't get much in the way of makeup... but that's because I feel I have too much of the stuff! But I did get some great body care products, a few re-purchases and some total bargains! 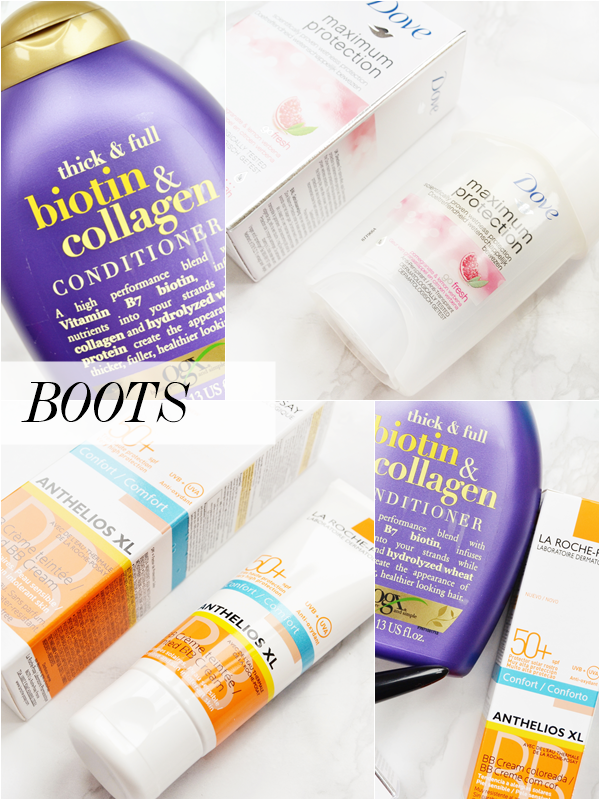 First up I went to Boots and to the clearance section! I always make a bee-line for it as it's always hidden away in some random part of the store and full of bargains, generally. I wasn't disappointed! Currently in my shower I have four OGX products! That is how much I love them. So when I spotted this interesting looking conditioner for only £1.50 (they're normally £6.99 I think) it had to be mine! I was actually tempted to stock up at that price but I decided to resist.... I'm now wishing I had. Yes, OGX shampoo and conditioners are a tad more expensive than the general high street price but they are worth it and you do get a larger amount - 385ml in fact. Really looking forward to trying this out now especially because it smells amazing and the conditioner is actually purple. This was another amazing clearance find that I couldn't not buy! It was actually reduced to £6.50 but when I went to the till it came up at £4.50 - my lucky day clearly! I didn't really need this as I have a Tinted SPF50 already and it is for dry skin but I do have combination skin and can make it work for me I'm sure. Another amazing saving! Lastly in Boots I picked up another Maximum Protection deodorant as it was half price. I've realised that both the Dove Maximum Protection and the Sure Maximum Protection deodorants are the exact same product and as I really like them I make sure to pick one up when they are reduced to half price because no one wants to be spending £5.00 on a deodorant, do they? I never thought I would be a cream deodorant type of girl but this product turned me around as it offers such great protection. Stepping into a busy Superdrug on a Saturday afternoon instantly took me back to my teenage years when I would be there every weekend to buy new makeup for the night ahead or a face mask for a sleepover! Though now kitted out as a super modern store with many more beauty brands it really does still take me back. Anyway... onto what I picked up! Whilst browsing the body care aisle I spotted that the entire Palmers range was discounted. 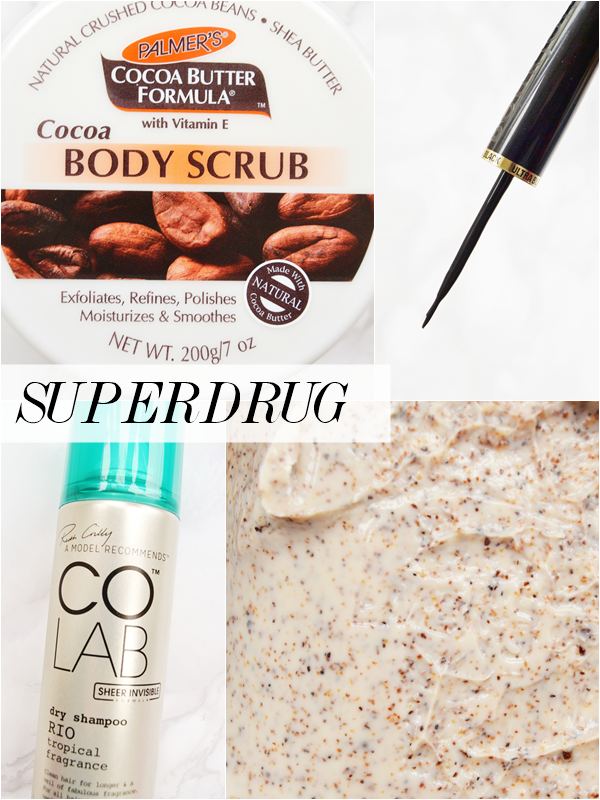 After having a look I decided on this Cocoa Body Scrub as I have a lot of fresh fruity body scrubs in my shower but no yummy foodie type ones. Once I got this home I was able to have a smell and oh lordy this stuff smells gooood!! I'm talking it smells like a dessert, good. In fact it reminds me of chocolate brandy cream! I seriously can't wait to use this now. A re-purchase here of my favourite liquid liner. I discovered this line earlier in the year and it fast became my favourite go-to liner as it is ultra black like it states and the flexible brush is a breeze to use. Before using this I still found liquid liner daunting but the nib of this is so smooth and flexible you are able to rest in just above the lash line and sweep it along the eyelid in one fluid motion. If you are after a new liquid eyeliner you really should give this a go! Last but not least I picked up my favourite dry shampoo. I was actually looking for the new Monaco scent in the range but I couldn't spot it, so I picked up the Rio scent instead which I've used before and also really like. I've said it before and I'll say it again, Colab is so much better than Batiste! 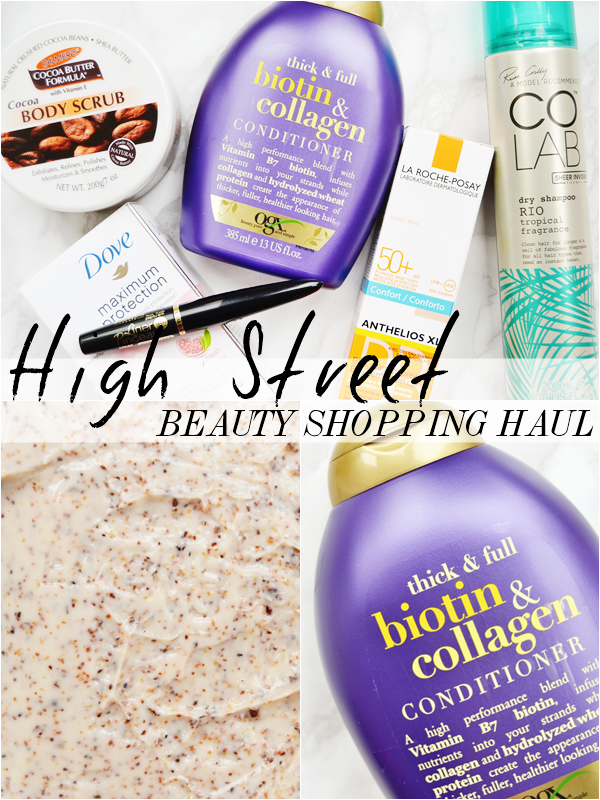 What have you recently picked up from the high street?